Lucian Kim ’92 calls himself a wanderer. The summer before his first semester at Clark University, he backpacked his way around Eastern Europe. He did it again two summers later — then spent his junior year studying abroad in Germany. He made his first trip to Russia that year as well. All that roaming has served Kim well. 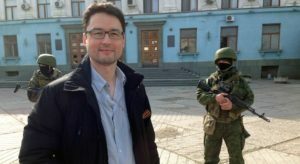 Currently National Public Radio’s Moscow correspondent, he has covered Russia, Ukraine, and Germany for media outlets including Bloomberg News, Reuters, Slate, Newsweek and The Christian Science Monitor. Kim enrolled at Clark at the urging of his father, Ha Poong Kim ’58 (an uncle, Sang Kyong Kim, M.A. ’59, and cousin, Stefan Deuchler, are also alumni). At Clark, Kim majored in geography and foreign languages.His mother was a native of Switzerland, so he grew up speaking German. He took advanced courses in German, as well as French and Spanish, but was keen to learn Russian. Today, Kim recalls the popularity of Russian 101 classes in his first year at Clark. “This was 1988, the time when there were monumental changes happening in the Soviet Union, and people were interested.” In his senior year, Kim took advanced Russian language classes at Holy Cross (he’d also studied the language at the University of Trier in Germany during his junior year abroad). A seminar on Mikhail Gorbachev, taught by Professor Zenovia Sochor, inspired him to focus his attention on political and social upheaval in Eastern Europe. Sochor has since passed away. “I feel some regret that I was unable to let her know what an influence she had on me,” he says. Kim’s ability to observe and assess arose from a rare source: a course called “The New England Landscape,” taught by Professor Martyn Bowden. The class included field trips to study architecture and search for historical clues in the countryside, sometimes just by exploring stone walls. “He taught me to look at the world,” he says. “That skill became very important to me as a journalist. I think a lot of what you learn in college becomes subconscious. You might not remember the details of the material, but you’re equipped with certain observational, analytical skills. That’s what I’ve got: the ability to observe, to see things that aren’t necessarily obvious. Lucian Kim reports from Simferopol, Crimea, in 2014. Kim started his journalism career in Berlin in 1996, as a correspondent for The Christian Science Monitor, covering Germany, Eastern Europe, and Central Asia. One assignment took him to pre-9/11 Afghanistan. There, he endured a harrowing helicopter ride to the mountain stronghold of Ahmad Shah Massoud, where he interviewed the legendary Mujahedeen commander who helped drive out the invading Soviet Red Army in the 1980s and was leading the last resistance to the Taliban militia. Kim joined NPR in 2016 and returned to Moscow, where he covers all things Russia, as well as the former Soviet states. Last October, he reported on the Russian “troll factory,” an office complex in St. Petersburg where hundreds of employees spend their days flooding social media with disinformation and fake news. It helped that his parents had accepted his travel. “There was no use in trying to stop me,” he laughs. His only means of communicating with home were rare phone calls and a few postcards. As an American correspondent in Moscow, Kim knows he’s in a much safer position than his Russian colleagues. “Journalists who are doing investigative work for Russian media outlets or uncovering stories the government would prefer to keep covered — these people can face real physical danger. Even reporters of local issues can be targets. Kim insists he feels “very comfortable” in Russia. Spoken like a seasoned wanderer. This story was published in the winter 2018 issue of Clark magazine.